Like a fashion mannequin, the dummy looks like a human, but its more-than-skin-deep beauties consist of high-tech instrumentation and a state-of-the-art physique. And like the ventriloquist's version, the crash test dummy can't speak except in a highly effective series of television commercials for seat belt safety. Highway safety agencies around the world rely on the crash-worthiness test in which an automobile is rammed into a brick wall to observe damage and generate data about the car's performance. The occupants of the test vehicle are crash test dummies (properly called "Anthropomorphic Test Devices") that are fabricated to resemble and respond like human bodies and that are loaded with sophisticated instrumentation. The instruments record information on acceleration, speed, deceleration on impact, force of impact, and the various motions and deformations of each dummy's torso and limbs. These data are studied by safety engineers and related to behaviors of human occupants and their potential injuries. The crash test method has major flaws despite its universal acceptance. The automobile (or other vehicle) is partially or fully damaged, depending on the test objective. The dummies can be retrofitted and reused many times, but their ability to respond with all the complexities of human bodies is always being perfected. Prior to the late 1940s, automobiles were tested using cadavers. Injuries could be observed on real bodies, but cadavers did not respond like breathing, flexible beings. Crash test dummies were developed in 1949 under contract to the U.S. Air Force for testing aircraft ejection seats that were mounted on rocket-propelled sleds on rails. "Sierra Sam" was the first dummy. The automotive industry later used the same type of dummy to develop lap seat belts and shoulder harnesses. Sierra Sam resembled the average adult male with a statistically correct weight and articulated limbs; however, Sam's spine and neck were rigid. The acceleration of his head as it followed the path of ejection could be measured, but this was far from sufficient for evaluating potential head injuries. By 1952, Mark 1 was manufactured from a plaster cast of a live man, and this dummy marked a huge improvement in the state of the art. His skull housed sensors for measuring acceleration and the force of impact, and it was cast from two pieces of aluminum. Mark l's spine consisted of a series of ball-and-socket joints with spacers to simulate the range of motion of a real backbone. The dummy also had a set of steel tubing ribs, vinyl skin, and foam flesh, but stiff limbs. Other dummies developed through 1956 were modified and instrumented to measure a selected range of motions. Dummies of sizes and weights other than average were made for the first time, and these post-Mark 1 dummies were used to test tractor safety, frogmen's suits for underwater escapes, and flight and safety aspects of space research for the National Aeronautics and Space Administration (NASA). Space programs motivated the next advances in dummy design. To evaluate the effects of rocket thrust on astronauts strapped into the seats of space capsules, the American and European space programs funded the invention of the Grumman-Alderson Research Dummy (GARD). The seated astronaut had to be perfectly aligned with the direction of rocket thrust, or both the man and seat would twist out of place. GARD was an important technological step because the processes of locating the center of gravity and evaluating the moment of inertia (the tendency to rotate with acceleration) were well instrumented in this durable dummy. GARD is still used to test ejection seats because the seats restrict motion ranges in this mannequin keeping them simple enough for engineers to measure rotations, acceleration history, and the stresses between the man and the seat. Until 1966, the aviation industry, military aeronautics, and the space program led the development of test dummies. The automotive industry became the driving force in developing crash test dummies that year as automobile fatalities emphasized the need for improvements in the dummy's rib cage, spine, pelvis, and abdominal cavity to evaluate restraint systems. Mathematical models and experiments with separate ranges of the body showed that motions could be simulated with spring connections. The springs move on impact, and they also rebound so effects like whiplash can be studied. Tests of lap safety belts concentrated on injuries to the pelvis, but development of the shoulder harness required the dummy to have a breastbone (sternum), clavicles, and shoulder blades. The harnessed dummy was equipped with an instrumented visceral sac that imitated the motions of internal organs. Instrumentation was also installed in cavities in the thighs, chest, and head so that more complicated movements and force deflections could be studied. By 1970, it was apparent that the adult-sized, male dummy did not accurately represent the smaller proportions of children and females. In fact some injuries to the smaller physiques were being caused by belts and harnesses that were proven safe by the average dummy. A larger male model and the first female dummy were produced in 1970 and were named Sierra Stan and Sierra Susie. That same year, they added to their family with Sierra Sammy (a six-year-old) and Sierra Toddler (a three-year-old). Neither child was correct in weight distribution, but at least they were represented and studied for the first time. The problem of evaluating injuries to children was complicated by the fact that many children are injured in automobile accidents because they are standing or not sitting conventionally during those accidents. The range of motions and potential impacts are, therefore, far more variable for unrestrained children. Redesign of the child dummies followed immediately, and modifications to child dummies continued to be the most intensely pursued area of crash test design from the 1970s through the 1990s. 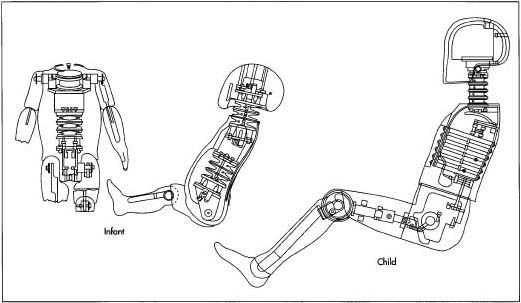 In the 1970s, improved data gave the children more flexible skeletons and more supple limb joints than adults, made them adaptable to various positions in the car, and improved instrumentation so the broader range of variables could be measured or interpreted. Development and testing of child safety seats, booster seats, and airbags necessitated special attention toward infant, toddler, and youngster dummies. Improvements in computer analysis were also revolutionizing crash tests by the mid 1970s. 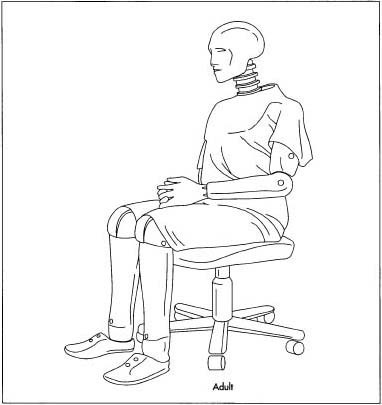 Computer methods allowed measurement of almost forty different parameters in the behavior of test dummies. Construction materials were similarly improved to make realistic, fully articulated dummies possible. To replicate the behavior of human bones, the dummy's bones were manufactured of fiberglass with greater breaking strength so the dummy could be used again. These many adaptations led to more and more specialized dummies, however, so models like the Supermorphic Dummy were made exclusively for car crash tests—they were too fragile for ejection testing. The first crash test dummies manufactured during the 1950s and 1960s did not address the differences between body types. Those first dummies were statistically correct adult males, and as such, they did little to represent the typical infant, child, and female body types. By 1970, the dummies' shortcomings were apparent and various body types were manufactured. because it forces the neck to elongate. Impact of an Indy car into a concrete wall reduces the car's speed by 40 mi (64 km) per hour in 70 milliseconds, and the driver feels an impact of 60 times the force of gravity. The sensor "black box" in the dummy evaluates all of the forces at work 2,000 times per second while the crash is in progress. Test dummy technology accelerated in development again with the design and testing of the airbag. The dummy family was diversified further to include still more body types. Fatalities from airbag deployment occurred most often among persons outside the statistical dimensions. These "small occupants out of position" or OOP occupants stimulated more evolutionary changes in the mannequins. Airbag deployment subjected the dummies to forces that exceeded their design capabilities. Significant upgrades to the dummy family had taken place by 1997 thanks to airbag testing and development of side impact airbags. The body of the crash test dummy is made of metal parts consisting of aluminum, bronze, or steel (depending on design, purpose, and body parts) as well as metal plating materials. A wide variety of plastics are also incorporated in most designs, and the plastics include Delrin (a type of long-wearing acetate resin), urethane and polyurethane foam, and vinyl. Most dummies are clothed to simulate reality, and specific vendors supply clothing, paint, and adhesives for marking critical targets or measurement points on the dummies. In fact, not only are outside suppliers used for many dummy constituents, but the federal testing agencies that approve dummy designs dictate specific vendors that must be used for some materials. Dummy manufacturers supply little or no instrumentation. Designs provide space for instrumentation to be secured, but instrumentation is so specific to actual testing conditions that the customers of the dummy builders install their own. Some small potentiometers are sometimes built into the manufacturer's lines, but more sophisticated instruments like accelerometers and load-measuring sensors are selected by the customer from their own instrument packages or specialized vendors. The design of crash test dummies is an intricate and isolated process limited to government agencies, dummy manufacturers, and customers like automobile manufacturers. The dummy makers are not responsible for creating their own designs. Instead, they receive drawing packages, sets of construction specifications, and specifications for required testing from the National Traffic Safety Administration (NTSA). European agencies provide similar sets of documents to dummy manufacturers. Based on their experiences in building dummies, repairing or retrofitting them, and observing their post-accident traumas, manufacturers of dummies, as well as users, do have input into design changes. The NTSA bases its designs on a multitude of data including accident reports, location within a vehicle, variations in physique and physical development, autopsies, and simulations. Biomechanics experts analyze all the available data and create the specifications that are sent to the manufacturers. The manufacture of crash test dummies is highly proprietary because of the complexities of design and the small number of qualified manufacturers in the world. All design and construction meets an extremely high set of standards there are no "B-grade" crash test dummies. When the drawing and specifications package for a new crash test dummy is received, the manufacturer begins by determining which parts and materials must be purchased from specific vendors, which must be acquired from a range of approved vendors, and which are to be manufactured in house. As examples, clothing for the dummies is furnished by a specific vendor; but, for the foam used to support the vinyl skin, the naming of specific vendors is avoided, and the manufacturer only has to meet certain equivalents. Patterns and molds for metal pieces to be cut or cast are made from the design drawings, and necessary tooling is done to prepare to make the metal pieces. They are cast, cut, heat treated as many as three times, plated, and machined to trim, smooth, and refine the completed pieces. Finally, the metal pieces are assembled using fasteners that are also specified. Plastics are similarly designed, tooled, and molded by injection molding or other methods suited to the part and material. Plastics are also machined and assembled or fitted to the metal parts. After the metal and plastic body of the dummy has been assembled, the skin is fitted to the dummy. Some skins consist of vinyl that is molded on the dummy with foam injected under the vinyl to give a firmness and pliability to the skin that resembles the real thing. Other skins consist of pieces of vinyl backed with foam layers. These pieces can be slipped on and off like clothes. The skin that covers the head is all one piece that fits over the aluminum skull. Colors are also very important to dummy skin. Many customers want flesh tones, but skin with red or yellow colorations is sometimes preferred when the dummy will be used in testing that is filmed. The yellow and red tones make precise measurement of movements on film easier. The dummy is designed with openings for instrumentation and cabling. These are in the larger parts of the body including the skull, chest, abdominal cavity, and the thighs. Clothing is sometimes fitted to the dummies in the factory or provided to the customer so the dummy can be dressed after the instrumentation has been inserted. The crash test dummy is made of metal parts consisting of aluminum, bronze, or steel as well as metal plating materials. A wide variety of plastics are also incorporated in most designs, and include Delrin (a type of long-wearing acetate resin), urethane and polyurethane foam, and vinyl. Most dummies are clothed to simulate reality, and specific vendors supply clothing, paint, and adhesives for marking critical targets or measurement points on the dummies. In fact, not only are outside suppliers used for many dummy constituents, but the federal testing agencies that approve dummy designs dictate specific vendors that must be used for some materials. testing, and calibration of the skull, neck, knees, other major joints, and sometimes other parts of the limbs depending on the use of the dummy. Depending on the type of physique the dummy is intended to represent, the test results will vary. A child's head mass, for example, is dramatically smaller than an adult's, therefore the head drop test will be quite different. A set of certifications—a kind of birth certificate—stays with the dummy throughout its useful life to prove its calibration testing and for use in rebuilding, retrofitting, and recalibrating it. There are no byproducts from dummy manufacture. Waste is limited to metal and plastic that can be recycled. Computer technologies have made the crash test dummy adaptable to the extremes of human activity through design improvements, testing methods, miniaturization of instruments, and data analysis. Ultimately, however, the computer may prove fatal to the dummy family. Computer simulations are becoming so sophisticated that they can represent car crashes, damages to the vehicle itself, and injuries to the occupants. Simulations are attractive to auto manufacturers because they eliminate some, if not all, destructive testing, which costs approximately $750,000 per test. Vehicle occupants can be examined after simulated impact, and the details of injuries to the head and spine especially can be analyzed. Up to three months of design time can be removed from the design-production schedule for a new car model, and new designs may be safer for a wider range of different-sized drivers and passengers. Dummy manufacturers, on the other hand, insist their families are here to stay. More modifications and complexities as well as technological applications have made crash test dummies reliable barometers for vehicle performance. Government agencies recognize this and are asking manufacturers to produce dummies and sensors that focus on very specific injuries. In 1995, this focus turned to lower legs, movement of the feet, and damage to Achilles tendons caused by frontal impacts. New sensors made the legs of the Hybrid 350 (certified in 1997) resemble those of a bionic man. In 1999, emphasis shifted to rear impact collisions and to developing state of the art vertebrae through cooperative research among agencies, universities, and manufacturers. Interest is also growing in skin simulants that will bruise and abrade during accidents; data from these developments will also aid doctors in improving treatments for skin injuries. Like its human counterparts, the crash test dummy is continuing to evolve for the purpose of saving our lives and limbs. McCraw, Jim. "What happens when an Indy car crashes." Popular Mechanics (June 1995): 66. "Virtual crash-test dummy." Science News (March 2, 1996): 138. Applied Safety Technologies Corporation (ASTC).1999. http://www.astc.net . (June 29, 1999). First Technology Safety Systems. June 14, 1999. http://www.ftss.com/ (June 29, 1999). Insurance Institute for Highway Safety. http://www.hwy.safety.org/ (June 29, 1999). National Highway Traffic Safety Administration. http://www.nhtsa.dot.gov/ (June 29, 1999). Robert A. Denton, Inc. http://www.radenton.com/ (June 29, 1999). TNO Crash Dummies BV. http://www.crashdummies.tno.nl/ (June 29, 1999).